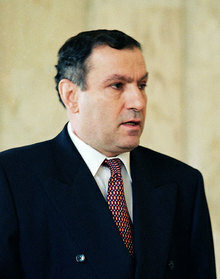 Levon Ter-Petrosyan was elected the first President of Armenia on October 16, 1991. Re-elected on September 22, 1996. Levon Ter-Petrosyan born on January 9, 1945, in Aleppo. Immigrated to Armenia in 1946. In 1968, Ter-Petrosyan graduated from the Oriental Studies Department of the Yerevan State University. In 1971, he completed his postgraduate studies at the Leningrad Oriental Studies Institute. In 1972, he completed his master's thesis. In 1987, he received his doctoral degree. In 1972-1978, Ter-Petrosyan worked as junior researcher at the Literature Institute of Armenia named after A. M. Abeghian. In 1978-1985, he held a post of a science secretary at Matenadaran named after Mashtots. Since 1985, Ter-Petrosyan have been working at Matenadaran as a senior researcher. Ter-Petrosyan's political career started in the 1960s. In February 1988, he led Matenadaran's "Karabakh" committee. In May of the same year, he became involved with the Armenian Committee of the Karabakh movement. From December 10, 1988, to May 31, 1989, he was under arrest together with other members of the "Karabakh" committee. In 1989, Ter-Petrosyan was elected Member of the Board of the Armenian National Movement. Later on, he became the Chairman of the Board. Ter-Petrosyan was elected the first President of the Republic of Armenia on October 16, 1991. Re-elected on September 22, 1996.